Acrylic case is beautiful and elegant, with intelligent fan control, both sound quality and performance are superior to similar amplifiers. In the case of low power operation, the heat is low and the fan does not need to operate to avoid noise. In high power operation, the system will detect the temperature rise and automatically run the fan. 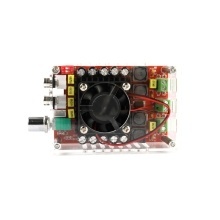 Use the TDA7498 chip, it is a 100W+100W Class D audio amplifier. The IC chip is powered by a single power supply and is mainly used in home theaters and active speakers. The TDA7498 is packaged with a fan-cooled EPU hyper-threaded package that is superior to similar amplifiers in terms of sound quality and performance. Easy to install and use, has a long service life.